This article identifies trusts as a legal structure associated with the global spread of financialization. Although trusts originated in Medieval England, they have acquired a new significance in contemporary finance by virtue of their advantages in terms of profit maximization and capital mobility. 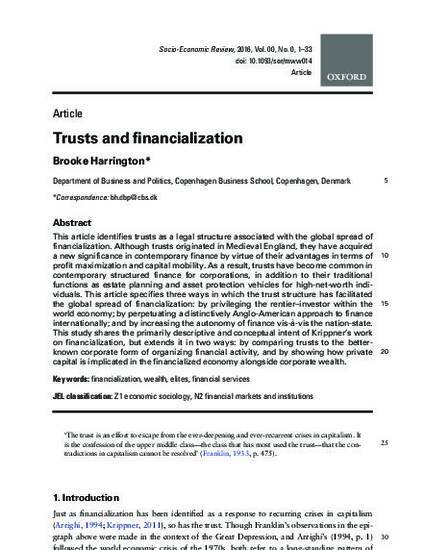 As a result, trusts have become common in contemporary structured finance for corporations, in addition to their traditional functions as estate planning and asset protection vehicles for high-net-worth individuals.This article specifies three ways in which the trust structure has facilitated the global spread of financialization: by privileging the rentier–investor within the world economy; by perpetuating a distinctively Anglo-American approach to finance internationally; and by increasing the autonomy of finance vis-a-vis the nation-state.This study shares the primarily descriptive and conceptual intent of Krippner’s work on financialization, but extends it in two ways: by comparing trusts to the better-known corporate form of organizing financial activity, and by showing how private capital is implicated in the financialized economy alongside corporate wealth.